More than 3000 workers are injured each year at work in Canberra. 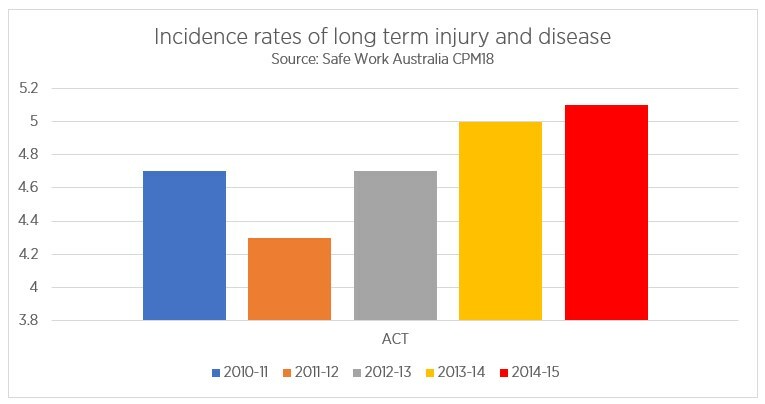 The most recent Safe Work Australia data shows workplace injuries have increased and at the same time, WorkSafe has dramatically reduced its inspections and enforcement activity. The ACT is the least safe jurisdiction in Australia for the construction, retail, and transport sectors. WorkSafe ACT was amalgamated into the Office of Regulatory Services in 2011 and then into Access Canberra in 2015. As a result of these amalgamations, the ACT no longer has a dedicated, independent full-time Work Safety Commissioner. Instead, the part-time Commissioner answers to the CEO of Access Canberra. UnionsACT is launching the No More WeakSafe campaign at the start of National Safe Work Month (October) to highlight the failures of the CEO of Access Canberra to prioritise enforcement of workplace safety laws. The campaign to highlight the issue of workplace safety will consist of awareness posters in workplaces and the community, social media, paid media advertising, and unions will hold a mass-rally on 26 October 2017. “The ACT is the least safe jurisdiction in Australia for construction, retail, financial services, education, healthcare, and arts. “The experiment to amalgamate WorkSafe into Access Canberra has failed. “Working people need an independent work safety authority focused on protecting workers’ safety, enforcing workplace safety laws, and holding unscrupulous, unsafe employers to account.